1Graduate School of Science and Engineering, Doshisha University, Kyoto, Japan; 2Department of Mechanical Engineering, Doshisha University, Kyoto, Japan. Copyright © 2013 Muhammad Rifai et al. This is an open access article distributed under the Creative Commons Attribution License, which permits unrestricted use, distribution, and reproduction in any medium, provided the original work is properly cited. 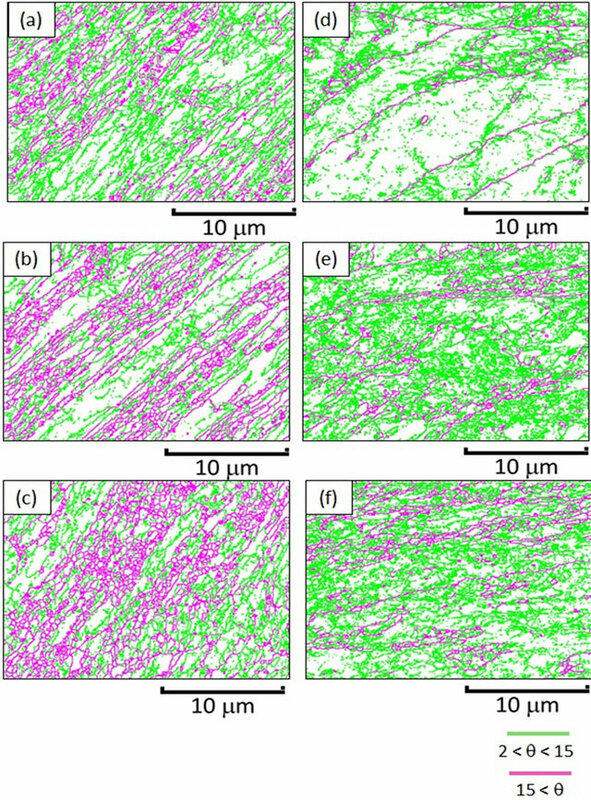 Microstructural development of ultra low C, N, Fe-Cr alloy and pure copper processed by equal-channel angular pressing (ECAP) have been examined focusing on the initial stage of the formation of ultrafine grain structure. 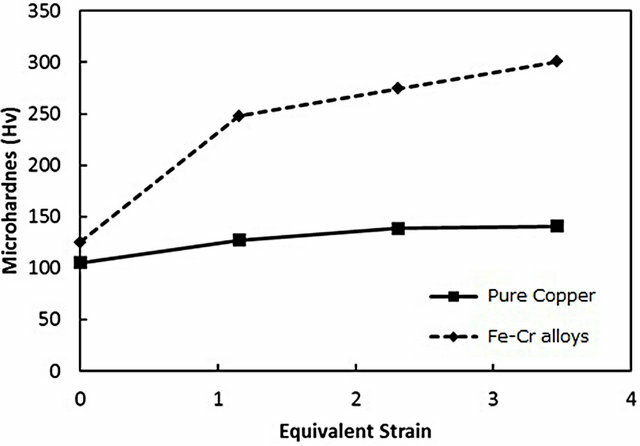 Fe-Cr alloys were pressed at 423 K while pure copper at room temperature for 1 to 3 passes via the route Bc to compare at the equivalent homologous temperature. Microstructural evolutions were characterized by electron backscatter diffraction (EBSD) image and transmission electron microscopy (TEM). It was found that deformation structures were mostly deformation-induced subboundaries in both the materials after one pass, but the fraction of high-angle grain boundary became higher in the Fe-Cr alloys than in pure copper in subsequent passes by increasing misorientation of the boundaries. The more enhanced formation of high angle boundaries in Fe-Cr alloys was discussed in terms of the nature of crystal slip of FCC and BCC structures. Application of SPD as a processing for fabricating ultrafine grained (UFG) material increased in popularity in the field of materials science and engineering. Equalchannel angular pressing (ECAP) is one of the SPD to produce UFG material and using a unique deformation processing by incremental shear restricted to the narrow zone parallel to the intersecting plane of the two channels [1,2]. The total amount of plastic strain is important as well as the amount of plastic strain imposed in one pass to produce ultrafine grained material . Large shear deformation can be applied to material in every pressing without changing the billet shape. UFG structures is generally considered to develop by grain subdivision mechanism, where grains are subdivided by deformation-induced subgrain boundaries or low-angle boundaries (LAB), followed by gradual increase of misorientation forming high-angle boundaries (HAB) . The majority of papers on SPD materials have been devoted to the face-centered cubic (FCC) materials such as Al , Cu  and Ni . For body-centered cubic (BCC) metals, carbon steels have mostly been studied [8-16] from a practical view point. [16-32], there are still very limited papers examining the microstructural evolution quantitatively in particular, the initial stage where dislocation substructure transforms into network of low/high angle grain boundaries. There are several comparative studies of BCC and FCC metals, which report the differentiate of UFG formation and final grain size [22,33-38]. Comparative studies of UFG formation in BCC/FCC crystals were reported in accumulating roll bonding (ARB) [14,33,34] and high pressure torsion (HPT) [35,36]. ARB processed material shows higher fraction of high angle grain boundary in IF-Steel, than in OFHC-Cu . The large amount of LAB fraction in OFHC-Cu was attributed to recovery and recrystallization during the ARB process . However, in ARB, pure iron or steels as BCC material were mostly rolled at 773 K to obtain good bonding while aluminum as FCC material was rolled at room temperature or 473 K. Namely, the formation of UFG is compared at different homologous temperature . Therefore, the influence of thermal activation is different in both the materials on the formation of UFG. In this context, we carried out experiments at the same homologous temperature, focusing on the difference in microstructural evolution of FCC and BCC at the equivalent thermal activation during ECAP. Dislocation structures, and microscopic parameter such as the fraction and spacing of HAB, distribution of misorientation and dislocation density of pure copper and Fe-Cr with extremely low C,N were carefully examined and compared focusing on the initial stage of UFG formation during ECAP. Figure 1. (a) Schema of ECAP; (b) Route Bc of ECAP. Figure 2. Microstructure using OM for (a) Fe-Cr alloys; (b) Pure copper. scope of field-emission type (FE-SEM, JSM 7001F), equipped with electron back-scattered diffraction (EBSD, Oxford Instrument Co.) image, and a transmission electron microscope (TEM) were used to examine the microstructures. EBSD orientation maps were processed using INCATM software. Thin foils for TEM were polished using abrasive papers to about 100 mm thick and then thinned by a twin-jet polishing facility using a solution of nitric acid 33% and 67% methanol for pure copper and acetic acid 40%, phosphoric acid 30%, nitric acid 20% and distilled water 10% for Fe-Cr alloys. Hardness experiments were performed on a Vickers hardness testing machine at room temperature. Three-dimensional orientation image maps (OIM) were obtained by EBSD after ECAP are shown in Figure 3. 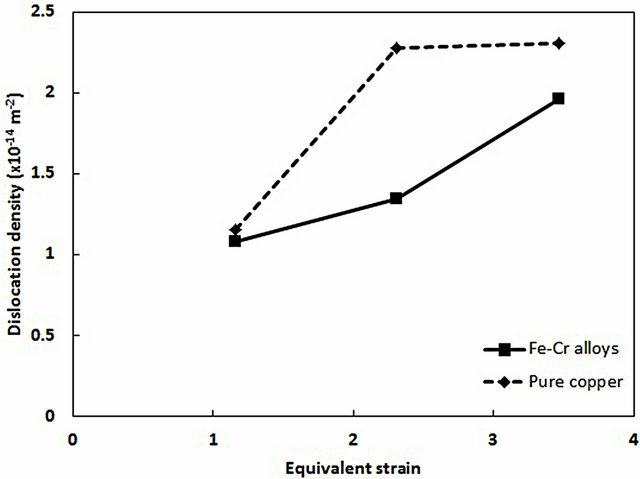 It is apparent that grains are more finely subdivided in Fe-Cr alloys than pure copper after the first pressing in spite that the former material has larger grain size before ECAP. Furthermore, arrays of planar and extended grain boundaries are developed parallel to the macroscopic shear plane of ECAP in Fe-Cr alloys whereas grain boundaries are rather curved in copper. After three passes, both materials were finely fragmented, but boundary spacing was still smaller in Fe-Cr alloys. Figure 3. 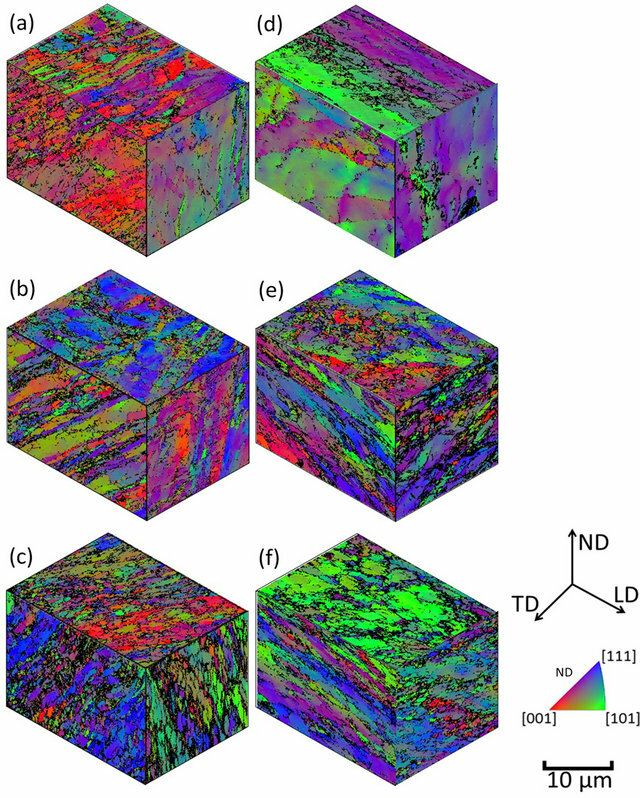 3D representation EBSD orientation color map of Fe-Cr alloys after ECAP (a) One pass; (b) Two passes; (c) Three passes, and pure copper after ECAP (d) One pass; (e) Two passes; and (f) Three passes. Figure 4. Misorientation map of Fe-Cr alloys after ECAP (a) One pass; (b) Two passes; (c) Three passes, and pure copper after ECAP (d) One pass; (e) Two passes; and (f) Three passes. three passes while HAB were very scarce in pure copper, and they are still scarcer after three passes. It seems that lines defined as LABs in the misorientation map are diffuse, and mostly still dislocation cell boundaries in pure copper. Figure 5. 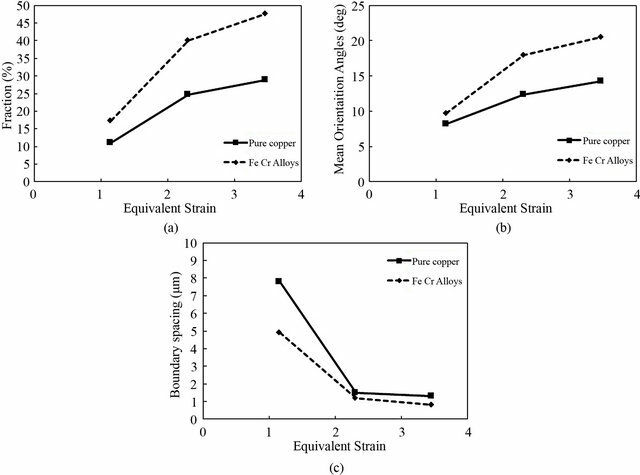 Distribution of misorientation of Fe-Cr alloys after ECAP (a) One pass; (b) Two passes; (c) Three passes, and pure copper after ECAP (d) One pass; (e) Two passes; and (f) Three passes. was given in the reference . However, while, boundary spacing decreased considerably after two passes in both the materials, there were smaller changes after three passes, as seen in Figure 6(c). Microstructure was observed using TEM (Figure 7). Dislocation cells structures were predominant after one pass in both the materials. However, elongated sub grains can be found out at Fe-Cr alloys and they became finely divided by sharper boundaries after three passes. On the other hand, subboundaries in pure copper after three passes are still diffused, and seem to be still mainly dislocation cell structures. Dislocation density inside grains was estimated from TEM images by Ham’s interception method . The thickness of specimen was estimated 245 nm for calculating dislocation density with Ham’s interception method. Fe-Cr alloys and pure copper show that similar trend of dislocation density as shown in Figure 8 with increasing number of passes. Figure 6. Microstructural parameters as a function of equivalent strain, (a) Fraction of HAB; (b) Average misorientation angle; and (c) Average boundary spacing. Figure 7. 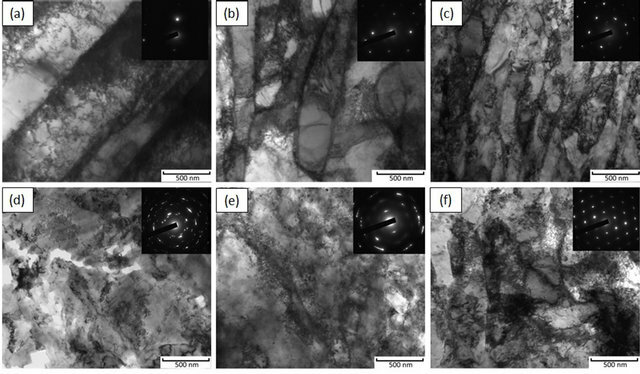 Microstructure using TEM of pure copper after ECAP (a) One pass; (b) Two passes; (c) Three passes, and Fe-Cr alloys after ECAP (d) One pass; (e) Two passes; and (f) Three passes. Figure 8. Dislocation density after ECAP for Fe-Cr alloys and pure copper. Hardness change after ECAP is shown in Figure 9. Hardness after a single pass increase significantly in both the materials, but the rate of becoming harder is higher in Fe-Cr alloys. It is probably because of higher HAB density with comparable dislocation density. Figure 9. Microhardness after ECAP for Fe-Cr alloys and pure copper. subgrain boundaries . This is the reason why the finer subgrains were formed in earlier stage after one pressing. In FCC, the dislocations tend to form pile-up rather than cross slip, then they are accumulated as plastic strain rather than absorbed in the grain boundaries and they are hard to be restructured as grain boundary dislocation. This may explain the reason why the fraction HAB is lower after three passes in pure copper in spite of comparable low-angle sub grain/cell size with Fe-Cr alloy. In this case, dislocation density should be higher in pure copper than Fe-Cr alloy at the same strain level. Dislocation density of Cu shows lower than Fe-Cr alloys as shown in the Figure 8, and it seems inconsistent with the explanation mentioned above. Possible explanation of lower dislocation of pure copper is dynamic recrystallization, which may occur during ECAP. Inhomogeneous microstructures observed in Figure 3 with large and small grains may be originated from the dynamic recrystallization. ARB Cu was carried out at ambient temperature with six cycles (ε = 4.8). The large fraction of low angle boundaries in copper was attributed to partial recrystallization during the ARB process due to high purity of the material and adiabatic heating. The possibility of dynamic recrystallization in copper during SPD is also reported in Accumulative Roll Bonding (ARB) . The microstructural evolution of Fe-Cr alloys and pure copper processed by ECAP for up to three passes was quantitatively analyzed by EBSD focusing on the initial stage of UFG formation. 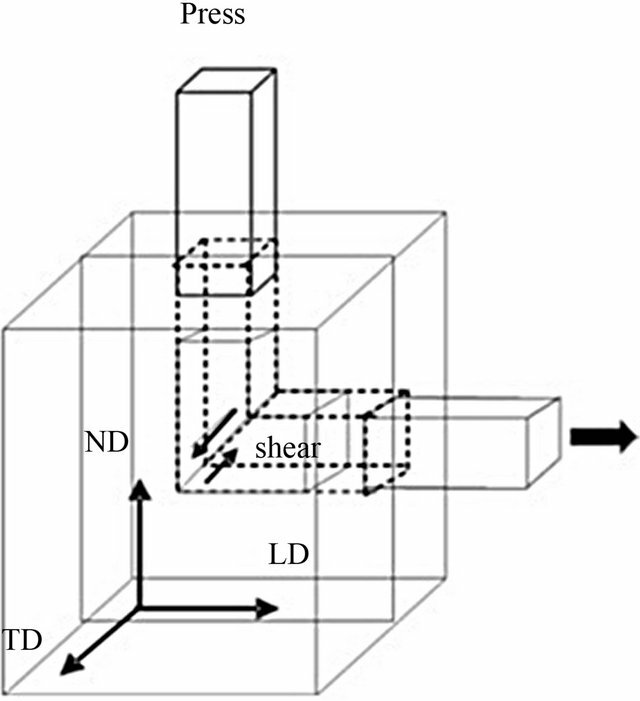 The deformation microstructure after one pass consist of deformation-induced extended subrain boundaries typical to the geometrically necessary boundaries. The density of the boundaries is higher in Fe-Cr alloys than pure copper. With increasing ECAP passes, the fraction of HAB and mean misorientation angle increase, and HAB spacing decreases. This phenomenon is noticeable in Fe-Cr steels, and can be explained in terms of slip behavior intrinsic to BCC structure. N. Hansen and D. J. Jensen, “Development of Microstructure in FCC Metals during Cold Work,” Philosophical Transactions of the Royal Society of London Series A, Vol. 357, No. 1756, 1999, pp. 1447-1469. 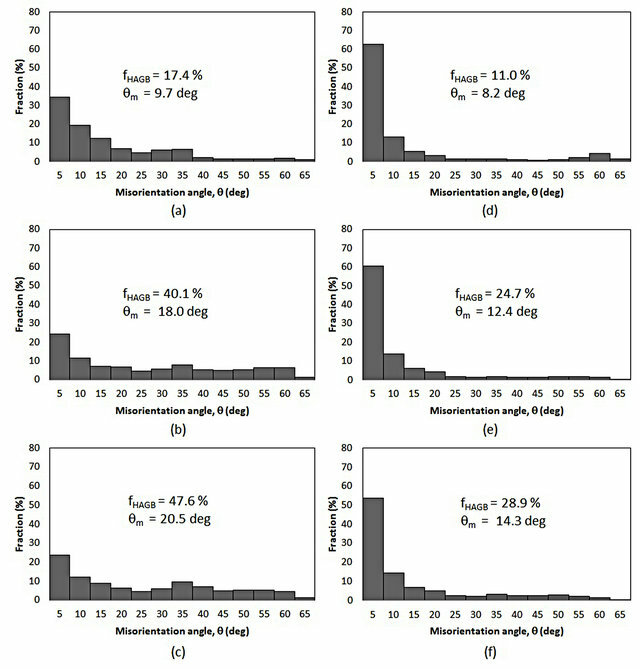 B. Han, F. Mohamed and E. Lavernia, “Mechanical properties of iron processed by severe plastic deformation”, Metallurgical and Materials Transactions A, Vol. 34, No. 1, 2003, pp. 71-83. B. Q. Han, E. Lavernia and F. A. Mahamed, “Dislocation Structure and Deformation in Iron Processed by EqualChannel-Angular Pressing,” Metallurgical and Materials Transactions A, Vol. 35, No. 4, 2004, pp. 1343-1350. O. Saray, G. Purcek and I. Karaman, “Principles of Equal-Channel Angular Sheet Extrusion (ECASE): Application to IF-Steel Sheets,” Review on Advanced Materials Science, Vol. 25, 2010, pp. 42-51.